Items here will cover the background and context for the threats to Cuba today. "GOAL: Promote Rapid, Peaceful Transition to Democracy in Cuba, Helping Develop Civil Society" Check out the goals of these programs and decide for yourself what sort of democracy and peace they allegedly seek. Cuba rejects the escalation of U.S. government aggression towards their country, calling the expelling of 14 Cuban diplomats "an irrational act of revenge on Cuba by the U.S. government." This is our paper on the relevant terrorist, propaganda and financial interference led by operatives of the US government that have been directed at destabilizing and violating the sovereignty of Cuba. (Secret memo exposes U.S. hypocrisy!) UPDATE ON THE CUBAN REFUGEE PROGRAM, from the US Interests Section in Cuba, Jan. 1994. This is a guide to the recent (up to June, 2003) events leading up to the current crisis. An excellent report by Alberto N. Jones on the historical struggle of Cuba to obtain independence and resist US imperialism, from the earliest struggles to now. Dr. Jones is the President of the Caribbean American Children Foundation, an organization that fosters bonds of friendship and support with the Afro-Caribbean English speaking Communities of Cuba. He is also a member of the Board of Directors of the Cuban American Alliance Education Fund. * FATIDIC adjective: Of or relating to the foretelling of events by or as if by supernatural means: augural, divinatory, fatidical, mantic, oracular, prophetic, sibylline, vatic, vatical, vaticinal, visionary. In his new exposé of the National Security Agency entitled Body of Secrets, author James Bamford highlights a set of proposals on Cuba by the Joint Chiefs of Staff code named OPERATION NORTHWOODS. This document, titled “Justification for U.S. Military Intervention in Cuba” was provided by the JCS to Secretary of Defense Robert McNamara on March 13, 1962, as the key component of Northwoods. 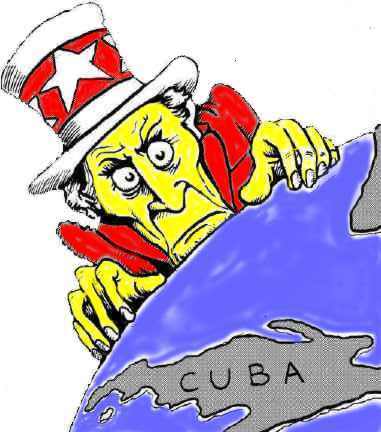 Written in response to a request from the Chief of the Cuba Project, Col. Edward Lansdale, the Top Secret memorandum describes U.S. plans to covertly engineer various pretexts that would justify a U.S. invasion of Cuba. These proposals - part of a secret anti-Castro program known as Operation Mongoose - included staging the assassinations of Cubans living in the United States, developing a fake “Communist Cuban terror campaign in the Miami area, in other Florida cities and even in Washington,” including “sink[ing] a boatload of Cuban refugees (real or simulated),” faking a Cuban airforce attack on a civilian jetliner, and concocting a “Remember the Maine” incident by blowing up a U.S. ship in Cuban waters and then blaming the incident on Cuban sabotage. Bamford himself writes that Operation Northwoods “may be the most corrupt plan ever created by the U.S. government.” Body of Secrets; James Bamford; Anchor Books, (begin reading bottom page 78). Operation Northwoods - Proof US Government Could Harm Americans, by William Douglas, details this plan to create terrorism. The FOI documents are in HTML and PDF form. Friendly Fire: U.S. Military Drafted Plans to Terrorize U.S. Cities to Provoke War With Cuba By David Ruppe PDF form. For different points of view and discussion on this amazing proposal, do a search at Google. El sistema político y electoral cubano - Cuban political and electoral system The Cuban political and electoral system.